I got some free time this afternoon down at my local tailwater - in town, about 1.5 miles from my doorstep - where there is a pretty healthy trout population as well as quite a few mountain whitefish. I usually catch rainbows and browns in the 8-15" range with enough whitefish to keep things interesting... 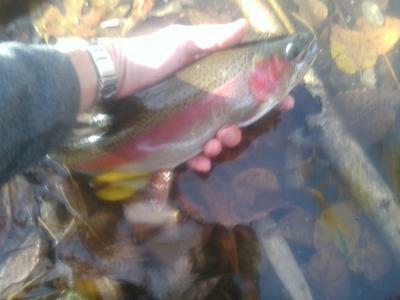 I've seen a few monster browns at different times and I've heard of quite a few larger rainbows as well. I know that in early November the department of Fish and Game stocks Steelhead not too far from here too, or I wouldn't be so unsure. Imagine my surprise when I hooked into this fish on a #10 Killer Kebari this afternoon ~ I've never caught a Steelhead, nor a rainbow this size, but at a hair over 21" with a big kype jaw, this piggie is really close to the line between Steelhead and rainbow. I didn't take my real camera, but I did manage to snap a couple of fuzzy ones with my cell phone. What do you think ~ big bow or steelhead? I do know my wrist still hurts and I can't believe my 6x tippet held out! Hard to say because I'm not sure where you caught it. You did say in a tailwater. If it is a landlocked tailwater i.e. not anadromous it's a rainbow. A stealhead is just a sea run rainbow from anadromous waters. In California our regs state; Any rainbow trout caught in anadromous waters that is greater than 16" will be considered a stealhead. Nice catch either way you look at it though. nice job!